For my project I am using the same technique that the father of genetics, Gregor Mendel, used to establish his Laws of Heredity: cross breeding. So, I have to breed and raise a whole lot of sea urchins. For a refresher, I’m trying to determine if there is heritable genetic variation in how sea urchin (specifically an Arbacia punctulata population from Woods Hole, Massachusetts) larvae respond to ocean acidification. To do this, I’m rearing sea urchin larvae in low and high carbon dioxide conditions and measuring their skeletal growth. I’m breeding 3 sea urchin males with 3 sea urchin females at a time, for a total of 9 crosses. To tease apart the impact of genetic variation on just the larvae themselves, I will be fertilizing the sea urchin eggs in water aerated with either current atmospheric levels of carbon dioxide, about 410 parts per million, or 2.5 times current atmospheric carbon dioxide levels, about 1,023 parts per million. Then, I will be rearing the larvae in water aerated with either 409 ppm CO2 or 1,023 ppm CO2. This will give me four different treatments for each cross, giving me 36 samples in total. By fertilizing and rearing them in the same and different levels of carbon dioxide I will be able to see how much of an impact being fertilized in water with a higher carbon dioxide concentration has on larval growth versus just the larval growth itself. It’s important for me to make that distinction because I just want to identify genetic variation in larval skeletal growth, and separate out any extraneous “noise” clouding out the data. I’m rearing the larvae in a larval rearing apparatus. Each of the 36 samples will be placed in jar with water aerated with the correct CO2 treatment. Each jar will constantly have atmosphere with the correct CO2 concentration bubbled in. Each has a paddle in it that is hooked to a suspended frame that is swayed by a motor. This keeps the larvae suspended in the water column. The jars are chilled to 14 C by a water bath. After a 6-day period the larvae are removed from the jars and their skeletal growth is measured. They are preserved with 23% methanol and seawater and frozen. This complicated-sounding hodge-podge of different devices enables me to do something incredible. I can look through the microscope at the larva, and also see the digitizing pad next to the microscope, where I hold a stylus in my hand. When I tap the pad with the stylus and the coordinates of various points on the anatomy of the plutei that I am tapping at get instantly recorded on my computer! The rotary encoder is the piece attached to the left side of the microscope and it enables me to record coordinates in three dimensions. Then, I can use those coordinates to calculate the overall size of the skeleton. My favorite part of doing science is learning how scientists are able to do the seemingly impossible- like measuring something microscopic. After I gather all of my data, I will do some statistical analysis to see the affect that the male parents have on the skeletal growth of their offspring. I will not be focusing on the impact that females have on the skeletal growth of their offspring. The quality of the egg itself could be an influencing factor on the size of the offspring, whereas sperm is purely genetic material. Like how I’m trying to isolate the influence of ocean acidification during larval rearing from during the act of fertilization, I am trying to isolate just genetic influences on larval skeletal growth from egg quality. Check back to see how it goes! 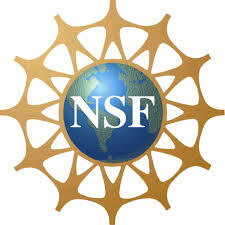 Special thanks to the National Science Foundation for funding this REU program, the College of Charleston and Grice Marine Laboratory for hosting me, and Dr. Bob Podolsky for mentoring me! Phytoplankton: unlike dolphins and other large marine organisms, these little creatures do not catch the attention of most people. Producing almost 50% of the world’s oxygen, phytoplankton provide a unique research opportunity to learn more about bottom-up controls on the environment. Phytoplankton have long been understood as key factors in ecosystem mechanisms, but the details of their functions still remain poorly understood. After spending the previous summer studying freshwater phytoplankton, I wanted to switch to marine environments to understand more about these small organisms. My project aims to understand the effects of vitamin B12 limitation on the photosynthetic efficiency of the phytoplankton. Photosynthetic efficiency refers to the ability of the organism to funnel as much useable energy as possible into photosynthesis. Certain nutrients and trace elements in limited concentrations affect the ability of phytoplankton to photosynthesize by inhibiting key steps in the metabolic pathway. 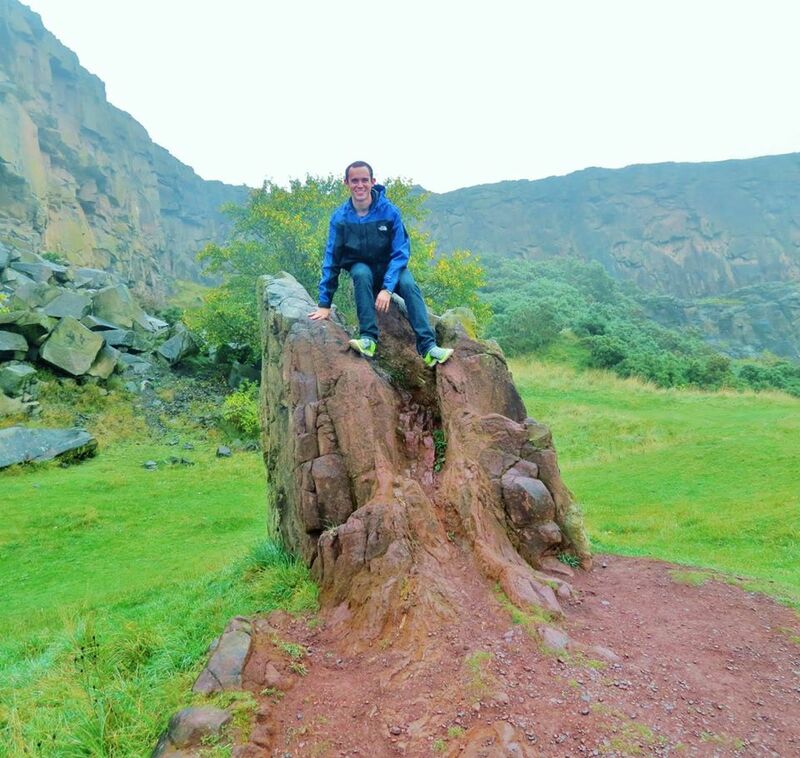 Vitamin B12, a possible limiting agent, can only be produced by microbes and recently the discovery of these organisms has exploded (New producer discovered, click here to find out more). I will be altering the nutrient balance for my samples, subjecting them to higher or lower levels of B12 and nitrates. 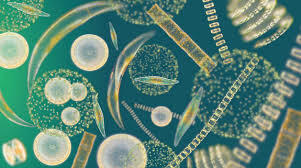 Until recently, most phytoplankton research has focused on inorganic compounds (nitrates, phosphates, etc. ), disregarding the importance of biologically active compounds like B vitamins. Under stress of nutrient limitation, the phytoplankton no longer efficiently use the energy from photons and thus emit the energy as fluorescence. The hope of this project is to better understand the influence of vitamin B12 on both mixed phytoplankton samples and a single species culture. Ultimately, the goal of this study is to elaborate on previous findings that implicate vitamin B12 in photosynthetic pathways. Few studies utilize B vitamins as a potential factor in phytoplankton systems. From this new understanding of the effect on photosynthetic efficiency, we can advise climate modelers to include or disregard vitamin B12 availability for their models as a potent limiting agent for phytoplankton. 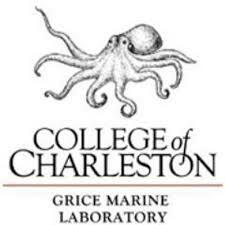 This project is possible due to funding from the NSF College of Charleston Summer REU program and the Grice Marine Laboratory. Project ideation and collaboration with Dr. Peter Lee and the Di Tullio lab from the College of Charleston. 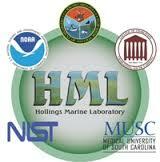 Lab space and facilities provided by the Hollings Marine Laboratory. Panzeca, C., A.J., Tovar-Sanchez, Agusti, S., Reche, I., Duarte, C.M., Taylor, G.T., Sanudo-Wilhelmy, S.A. (2006) B Vitamins as Regulators of Phytoplankton Dynamics. 596-597. Sanudo-Wilhelmy, S.A., Gomez-Consarnau, L., Suffridge, C., Webb, E.A. (2014) The Role of B Vitamins in Marine Biogeochemistry. Annual Review of Marine Science. 6: 339-367. Bertrand, E.M., Allen, A.E. (2012) Influence of vitamin B auxotrophy on nitrogen metabolism in eurkaryotic phytoplankton Frontiers in Microbiology 3: 1-16. 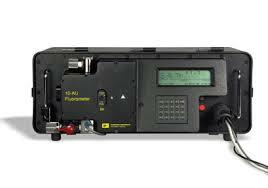 “ACT Technologies Database -FLUOROMETER.” ACT Technologies Database -FLUOROMETER. N.p., n.d. Web. 16 June 2015. If you’re not a climate change denier, you know that global climate change, mainly driven by the increasing amounts of carbon dioxide that humans release into the atmosphere, has been raising the Earth’s average temperature and will continue to do so for the near future. If you are particularly well-versed in your environmental science, you know that these increasing amounts of carbon dioxide are also causing the oceans of the world to become more acidic (see: coral bleaching) (1). Unless you are a marine or climate scientist, though, you probably don’t know why climate change is causing ocean acidification or how this will affect ocean animals besides probably not being the best thing ever for them. Our oceans actually absorb around 30% of the carbon dioxide we release into the air (2). 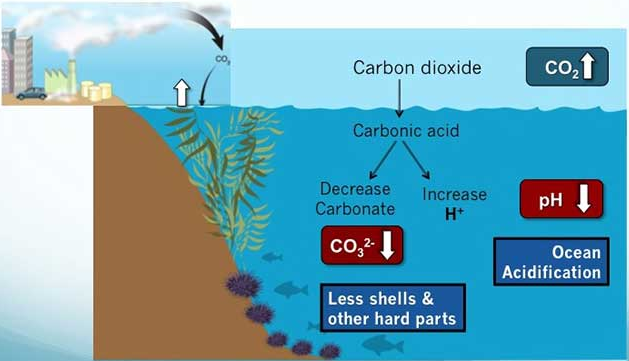 This CO2 hangs around as a gas mixed into the water and goes through a series of chemical reactions that both release hydrogen ions (the H in pH), therefore lowering the pH of the water and making it more acidic, and reducing the amount of carbonate available in the water for ocean animals and other organisms to use (2). Animals like sea urchins that build shells or skeletons out of calcium carbonate (the main ingredient in limestone) find this task more difficult when there is less carbonate around. 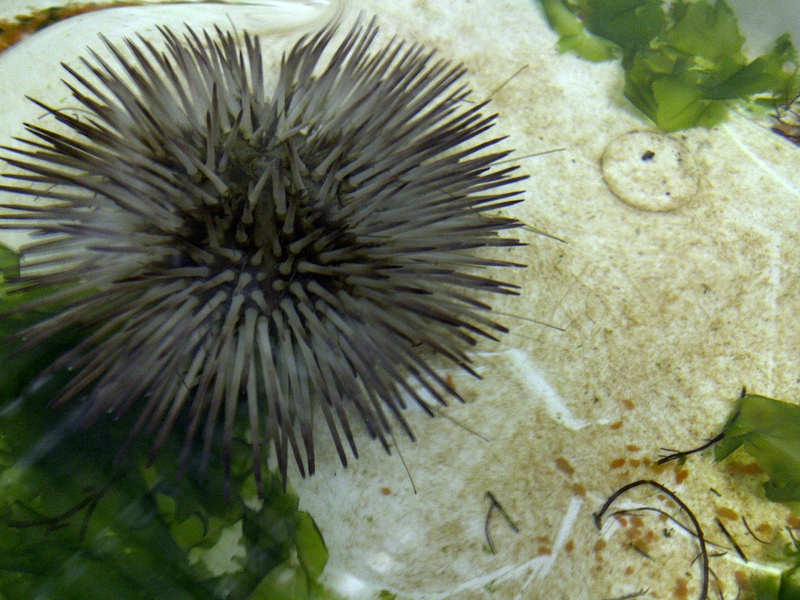 While the thought of sea urchins will bring to mind their hard, spiny exterior, these animals (yes, there are body tissues inside those aquatic pincushions) are actually most affected by ocean acidification during their larval stage of life, when they build a skeleton that allows them to swim around and eat (3) (urchin larvae are like insect larvae in that they behave and look very different from the full-grown animals they will eventually become). When oceans become more acidic and less carbonate is available, urchin larvae are smaller, which makes it harder for them to eat at the same time as they are more at risk of being eaten themselves (3). Unfortunately, a world with a lot fewer urchins would be a world where seaweed would easily overgrow ocean habitats and predators of urchins (like the adorable fuzzy otters that lay on their backs in the ocean and hold hands- google it) might have more difficulty finding food. I’m looking into whether sea urchins (specifically the species Arbacia puntulata, which is found in the Atlantic ocean) from Massachusetts and South Carolina will react differently in higher acidity. If one group of urchins can produce larvae that maintain a larger body size under more acidic conditions than the other group, then we will know that there is some degree of variability within the species. This would be a positive result for the sea urchins (and therefore for oceans in general) because it would mean that these urchins may be able to adapt to acidified waters more easily than we can currently expect. 1. IPCC, 2014: Climate Change 2014: Synthesis Report. Contribution of Working Groups I, II and III to the Fifth Assessment Report of the Intergovernmental Panel on Climate Change [Core Writing Team, R.K. Pachauri and L.A. Meyer (eds.)]. IPCC, Geneva, Switzerland, 151 pp. 2. Clark D, Lamare M, Barker M. 2009. Response of sea urchin pluteus larvae (Echinodermata: Echinoidea) to reduced seawater pH: a comparison among a tropical, temperate, and a polar species. Marine Biology. 156: 1125-1137. 3. Sheppard Brennand H, Soars N, Dworjanyn SA, Davis AR, Byrne M. 2010. Impact of ocean warming and ocean acidification on larval development and calcification in the sea urchin Tripneustes gratilla. PloS One. 5:1-7.